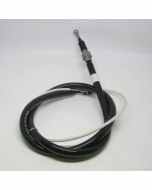 Rear parking brake cable for MK4 chassis cars from 07/99 and up. The end of the cable has a ball end. 1693mm.